Vintage Fender Champ Lineup – These are the Champions! This photo is a mind bender. 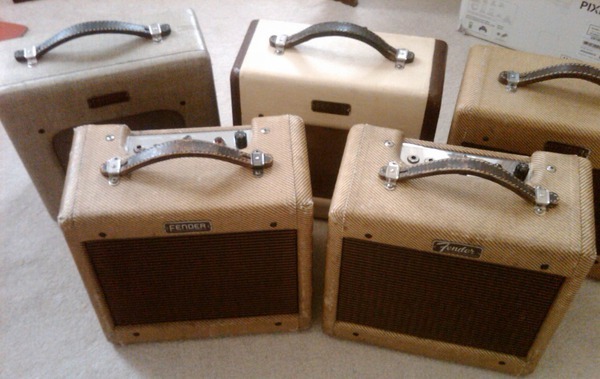 If you like tweed Fender Champs like I do, then you like looking at pictures of these great vintage amps. But what we are looking at here is something that doesn’t pop up that often – one of each variant of the Fender Champ from the pre-CBS glory days of Fender. This photo appears courtesy of Terry Foster, one of the authors of Fender: The Golden Age 1946-1970. Check out their blog on what went into producing the book. Amazing stuff and it is on my wish list for this spring when it publishes. 1948 Champion 800 (also known as the green tweed Champ). This is the earliest model Champ from 1948-1949. 1949 Two-tone vinyl Champion 600. These were produced from mid 1949 to 1953. 1954 Wide panel 600/5C1/5D1 wide panel cabinet with the controls still rear facing like on the two tone vinyl Champ 600 but now covered in the diagonal tweed that we all know and love. These were produced from 1953 till the switch to the narrow panel cabinet in 1955. From the Editor – I have revised this post per Terry’s comment below. My original descriptions didn’t fully appreciate the uniqueness of what was shared and I don’t want to leave them mislabeled. ~~JVI. With the exception of the two-tone and wide panel, these are as rare are they come. Very few Champion 800s are known to exist. I have personally only seen 3. This is the one from the Teagle and Sprung book and is near mint. The narrow panel ones are both small box examples from 1955. Fender only made each one for a few months before housing the Champ in the larger Princeton box and increasing the size of the box that housed the Princeton (which was shared with the Harvard). Thanks for the additional info Terry. This really is an amazing photo and I’m sure people are drooling over it! I STILL can’t quite wrap my head around truly unique it is to see all these great examples of vintage Champs in the same frame. Awesome collecting. I can’t wait to see what you have up your sleeve in your book! ex ped – I’ve adjusted the description in the photo for accuracy but have left my original post as is. I posted a pic of all the black tolex Champs for you on Twitter. Wow, gotta love this site. I have a one of a kind 1965 Champ BlackFace. A good friend of mine had the amp for around a two decades. We did some pre-production tracking with it prior to recording our albums. I was young and never really gave it much thought. Of course back then, tube amps were still plentiful. About 3 years ago, I saw it up at his place in Seattle. The little speaker was torn, the circuit board wasn’t working. He said he took it to Guitar Center and they said it would cost more to fix it than what it was worth (BoneHeads). Anyway I talked him out of it for free. Everything on the am is in excellent shape, just not functioning. I have another buddy that is a tube guy all the way (Blues Player). He has a 1967 or 68 SilverFace Champ and he told me whenI was ready, he knows a guy that went through his Siverface top to bottom and did it cheap. He himself refabbed the front board to wedge an offset 10″ Jensen from their Vintage series and he gave me one of the two Jensens for mine. This past winter, I was ready to get on the champ restoration project. My buddy took me to his Tube Amp Guy. He said likely the gel caps were all leaking and weren’t sure if the output transformer was blown or not. So, considering all these components, I wasn’t fixating so much on a restoration project as I was a one of a kind piece for my studio. I asked the guy to put new output transformer in that would run 6L6 tubes vs the original 6V6 config. He told me that as long as he doesnt have to modify the board (new holes etc… which he just flat will not do to a classic amp), he would be open to other ideas. He explained all the other modifications he would need to do to have it done right. I also had him change the Ohms to 8 Ohm load to run a 2X12 cabinent or the new 10″ I was mounting in to the front board. This is an outstanding modification. Unbeilievable versatility in sound! This amp is my absolute pride! I cannot tell you how impressive this amp performs. It showcases my studio and every guitar player chooses that amp over any other I have or regularly offer to get a client if he or she desires. It’s a no brainer. The Champ is the goto amp. Whether your playing a Telecaster, Strat or even humbuckers, it is unbelievable!